Each issue will feature design ideas for a specific packaging application. We produced this elegant rigid set-up box for a professional sports team. 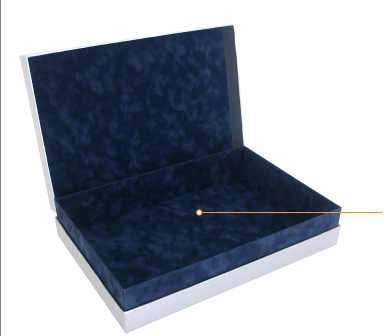 "Rigid set-up boxes" feature a non-collapsible lid and base - an ideal style for brand-conscious, impression-making applications. Lid, base and neck lined with Prestige suede material. Customize this idea for your next project by selecting cloth, velvet, full-color printing, or foam inserts. Lid and base wrapped with brush-textured Metal-X. box and slipcase products. Contact us today to discuss your next rigid packaging project!